What does glitter have to do with finding stars and planets outside our solar system? Space telescopes may one day make use of glitter-like materials to help take images of new worlds, according to researchers at NASA's Jet Propulsion Laboratory in Pasadena, California. Standard telescopes use solid mirrors to image far-away objects. But the large, complex mirrors needed for astronomy can be quite expensive and difficult to construct. Their size and weight also add to the challenges of launching a space telescope in the first place. A concept called Orbiting Rainbows seeks to address these issues. Researchers propose using clouds of reflective glitter-like particles in place of mirrors to enable a telescope to view stars and exoplanets. The technology would enable high-resolution imaging at a fraction of the cost. "It's a floating cloud that acts as a mirror," said Marco Quadrelli from JPL, the Orbiting Rainbows principal investigator. "There is no backing structure, no steel around it, no hinges; just a cloud." In the proposed Orbiting Rainbows system, the small cloud of glitter-like grains would be trapped and manipulated with multiple laser beams. The trapping happens because of pressure from the laser light -- specifically, the momentum of photons translates into two forces: one that pushes particles away, and another that pushes the particles toward the axis of the light beam. The pressure of the laser light coming from different directions shapes the cloud and pushes the small grains to align in the same direction. In a space telescope, the tenuous cloud would be formed by millions of grains, each possibly as small as fractions of a millimeter in diameter. 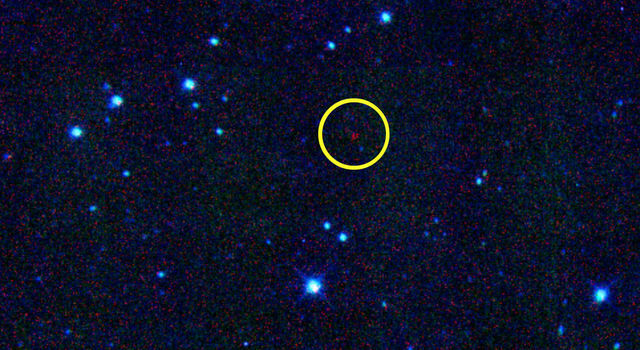 Such a telescope would have a wide adjustable aperture, the space through which light passes during an optical or photographic measurement; in fact, it might lead to possibly larger apertures than those of existing space telescopes. It would also be much simpler to package, transport and deploy, than a conventional space telescope. "You deploy the cloud, trap it and shape it," Quadrelli said. Nature is full of structures that have light-scattering and focusing properties, such as rainbows, optical phenomena in clouds, or comet tails. 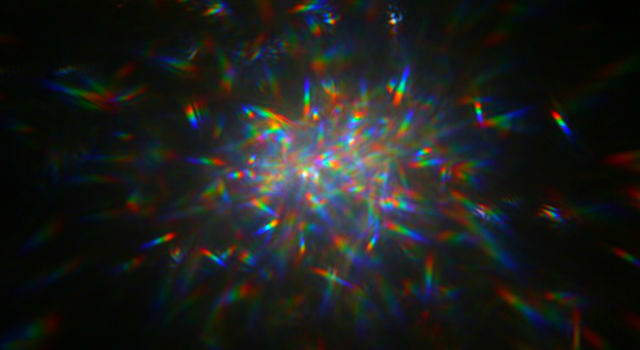 Observations of these phenomena, and recent laboratory successes in optical trapping and manipulation have contributed to the Orbiting Rainbows concept. The original idea for a telescope based on a laser-trapped mirror was proposed in a 1979 paper by astronomer Antoine Labeyrie at the College de France in Paris. Now, the Orbiting Rainbows team is trying to identify ways to manipulate and maintain the shape of an orbiting cloud of dust-like matter using laser pressure so it can function as an adaptive surface with useful electromagnetic characteristics, for instance, in the optical or radar bands. Because a cloud of glitter specks is not a smooth surface, the image produced from those specks in a telescope will be noisier -- with more speckled distortion -- than what a regular mirror would generate. That's why researchers are developing algorithms to take multiple images and computationally remove the speckle effect from the glitter. 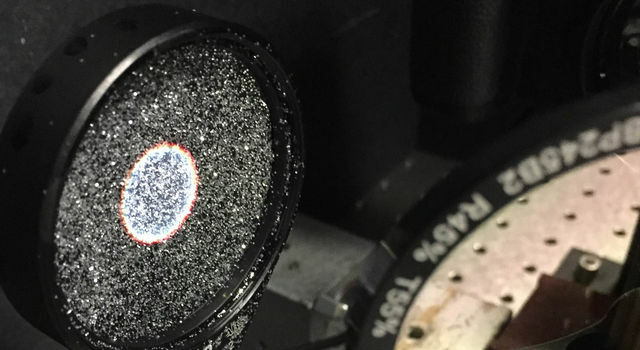 To test the idea, co-investigator Grover Swartzlander, an associate professor at the Rochester Institute of Technology in New York, and his students spread glitter on a concave lens in the laboratory. His team used lasers to represent the light from a double star system. They pointed the speckled mirror at the simulated stars, then used a camera to take pictures. With many exposures and lots of processing, an image of the two "stars" emerged using the glitter mirror. 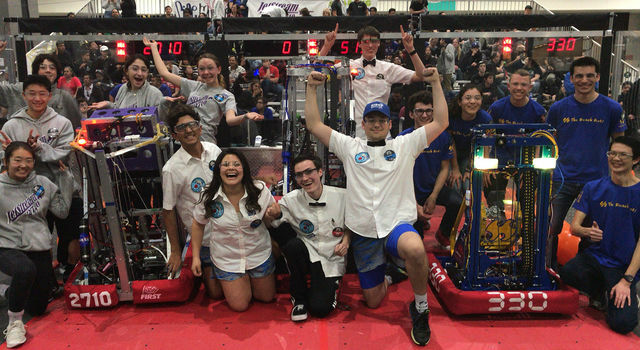 "This is a major achievement," Quadrelli said. "This demonstrates a highly controlled experiment in which we were able to do imaging in the visible light spectrum." 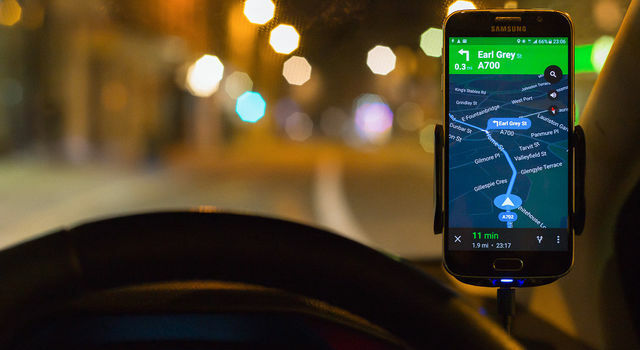 The technology could be used more easily for radio-band signals. Because the wavelength is so much longer (about one centimeter, compared to nanometers in visible light), the mirror grains don't have to be as precisely controlled or aligned. This opens up Earth science applications such as earthquake detection and remote sensing of water and other phenomena. JPL's Darmindra Arumugam is investigating possible mechanisms for remote sensing with Orbiting Rainbows. The JPL optical design team, including Scott Basinger and Mayer Rud, has been working on the adaptive optics techniques that would be needed by an Orbiting Rainbows telescope. So far, the team has been exploring reflective, refractive and diffractive versions of a telescope based on Orbiting Rainbows, with maximum sensitivity to one specific frequency. Orbiting Rainbows has not yet been demonstrated in space. 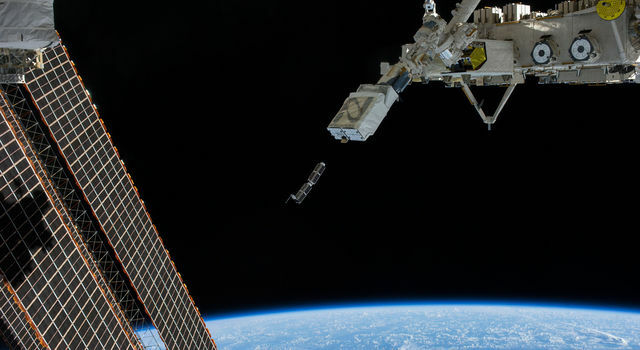 For a test in low-Earth orbit, the researchers would deploy a telescope with a small patch of particles, no larger than a bottle cap, to show that it can be trapped and shaped to reflect light. The next step would be to make many of these patches and synthesize an aperture with which to do imaging. The project represents a new application of "granular matter," materials such as dust grains, powders and aerosols. Such materials are very light, can be produced at low-cost and could be useful to the space exploration community. In this particular project, the "glitter" may be tiny granules of metallic-coated plastic, quartz or some other material. Orbiting Rainbows is currently in Phase II development through the NASA Innovative Advanced Concepts (NIAC) Program. It was one of five technology proposals chosen for continued study in 2014. 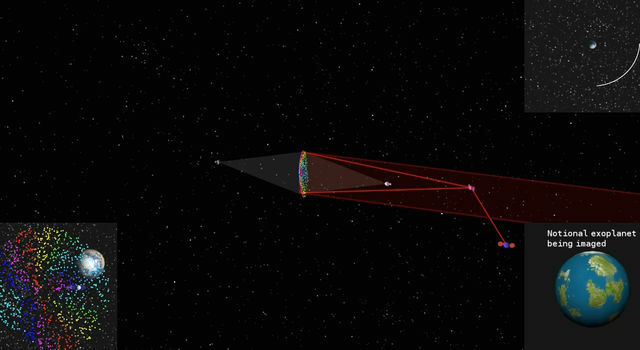 In the current phase, Orbiting Rainbows researchers are conducting small-scale ground experiments to demonstrate how granular materials can be manipulated using lasers and simulations of how the imaging system would behave in orbit. 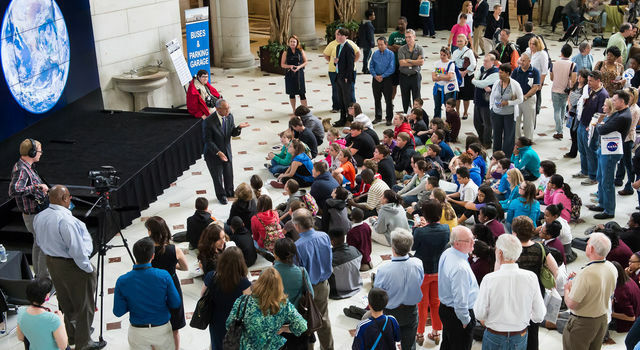 NIAC is a program of NASA's Space Technology Mission Directorate, located at the agency's headquarters in Washington. JPL is managed by the California Institute of Technology for NASA.